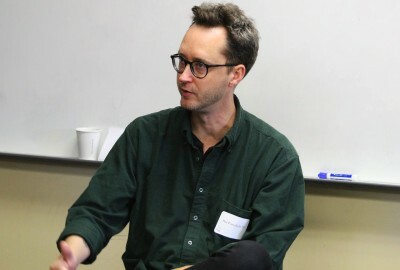 Park alumnus Matt Porterfield ’95 has been named a 2019 Guggenheim Fellow, a prestigious distinction that recognizes exceptional capacity for productive scholarship or exceptional creative ability in the arts. Out of nearly 3,000 applicants, Porterfield is among one of 168 scholars, artists, and writers selected this year. He was recognized in the field of film and video, and intends to write and develop a new feature in Tijuana, Mexico, for the Fellowship. Porterfield is a lecturer in the Program in Film and Media Studies at Johns Hopkins University, where he teaches courses in film production and theory. He’s written and directed four feature films, with his most recent, Sollers Point, winning the top jury prize for an American independent feature at the 2018 Champs-Élysées Film Festival in Paris. His work is in the permanent collections of the Museum of Modern Art and the Harvard Film Archive and has screened at the Walker Arts Center, Anthology Film Archives, Centre Pompidou, Cinematheque Française, and film festivals such as Sundance, the Berlinale, San Sebastien, Rotterdam, BAFICI, and SXSW. Porterfield is one of two Park graduates named 2019 Guggenheim Fellows, the other being Professor of History and Law Lauren Benton ’73. Photo: In December 2018, Porterfield presented at Paths after Park, an event that brought 52 young alumni together on campus to share their life experiences with Upper School students and shed some light on what life after Park may look like.